Cavia’s Nier under the wings of Square Enix is a rather different game to what you might have seen before, although it is caped in familiarity once you dig beneath the surface. Part action game, part adventure, with a splattering of RPG thrown in for good measure probably goes some way to describe this hybrid game. Nier is the leading character, a man in his forties, with time on his hands to undertake various odd jobs all the while tending to his daughter who has been infected by a terrible, somewhat incurable illness. With pure grit and determination on his side, Nier looks to the lands to find a way to bring comfort and normality to his daughter’s life, but in undertaking the task enters an adventure that takes him to places he couldn’t even fathom. 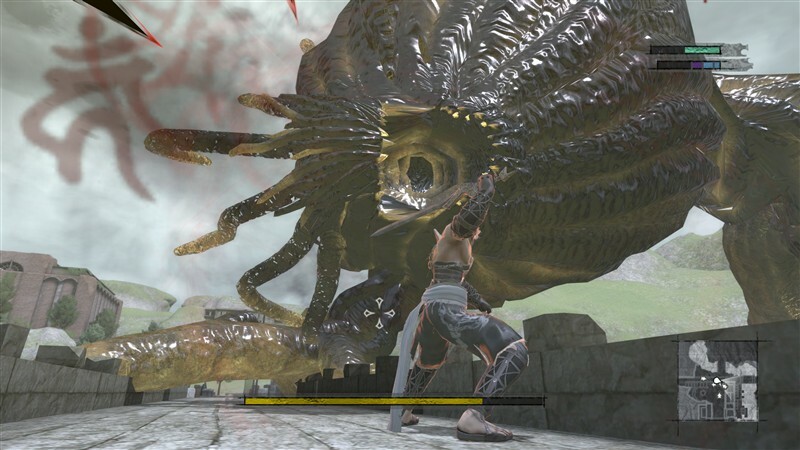 The start of the game has Nier (or someone like him) battling creatures called ‘shades’. In this instance they seem endless as you swipe away with a pipe or stick whilst levelling up and earning all sorts of powers. After what seems like an age and you’ve gone from level 1 to 30 the game fades to black and you begin the game proper. Not much explanation is given other than 2000 years have passed since then and it’s now you the character Nier and his daughter Yonah in a village looking for answers. It’s quite hard to nail the gameplay here because it seems to derive from many influences. At the start of the game there’s a distinct rpg like flavour as you walk around the small village talking to the inhabitants and undertaking quests. These activities range from simple fetch specific items from somewhere, to finding missing people and such like, there’s little variety but they make for a distraction from the main story and are a means to getting some much needed cash which in turn can be used to buy better swords and such like. As you progress through the game’s story you’ll find that with the use of magic attacks and melee with swords etc, the action heats up, taking on a different guise to running about talking to folks. The developers throw all sorts of obstacles in your path with some minor platforming elements and some puzzle solving to keep you on your toes. In fact, the game seems like a melting pot of ideas because as you delve deeper into the story you’ll encounter many play styles thrown into one. A Resident Evil style mansion in black and white complete with overly large spiders, fixed camera angles and haunting screams pays homage to the great series – rather obviously intentionally. A choose your own text adventure becomes a mission of resolve in itself complete with optional side quests fleshing out the experience. An isometric top down action sequence in the underbelly of a mansion another moment where the game switches pace. It’s a bit of a jack of all trades type game and whether this will play havoc with your expectations or you’ll embrace them with joy rests on a very fine line. The choose your own text adventure section in particular seemed to drag on a bit too much, and if you’re of twitchy fingers then skipping the rather well written and somewhat interesting text would mean you’d miss out, and possibly head for the eject button prematurely. One moment which is bound to frustrate many gamers is a section early on where you’re required to do a spot of fishing, and catch a certain type of fish. Sounds interesting, except the fishing mechanics are pretty rough around the edges, coupled with the fact that you’re told to fish on a beach. There’s a beach right next to where you’re given the quest, and so you cast out and play the game for what again feels like an eternity wondering why you’re not catching the illusive fish and building up a number of sardines instead. The game grinds to a halt here unless you cheat and go online and look for the answer – which is so obvious yet so cryptic at the same time. In this case, the beach you’re supposed to go fishing on is further away, marked as a red X on the mini map, and so the frustration ends and you kick yourself for not being so literal. Vague is probably the best word to use here. Fishing aside, When the game does do things right though with it’s interesting take on magic and upgrading weapons with ‘words’ collected from defeated enemies, then there’s lots of action orientated fun to be gleaned from the game. However, the fusing of various elements is quite a risky procedure especially as you’re able to plant seeds and then sell the produce for profit amongst all the hard nut killing of creatures. Yes, the mind boggles. Nier looks dated, and in fact has some horrid looking animations, uninspiring character designs and texture quality of a low standard. It’s a game where you really need to look beneath the surface to see that there’s more to life than just looks. There are some interesting locations but the lack of overall flair make the game look a bit muted. It’s certainly not up to scratch in this day and age, but again, is manageable if you keep an open mind. Moving away from the visual quality and the sound enters another realm altogether with some brilliantly crafted pieces of music which are way above the quality of the rest of the game. The voice acting, especially of the side kick book Weiss you pick up early on is second to none – sounding like a cross between Alan Rickman and Pierce Brosnan and utterly amazing. The dialogue is witty, adult, sarcastic, entertaining and for the most part voiced by actors giving it their all. The game really does poke fun at itself and gaming clichés and is a joy to listen to. The story is pretty engaging and is something that is positive for the experience, it’s just a shame other areas of the game bring it down. It’s an RPG so expect to pump in a fair few hours in here. The story is interesting enough that you’ll want to see it through to its conclusion, but the additional side quests might begin to grate after a while due to the lack of variety. If you’re after doing them all, then be sure to use multiple saves and make sure you complete them before continuing with the main story. Nier is an ambitious game for Cavia, and in a way they have pulled off what they set out to do, but in doing so have created a monster. The sheer mix and match of styles might leave you weak and confused and in some cases drained and heading back to the shop where you purchased the game from, but you’d be doing yourself a disservice. Once you remove the shackles of expectation and simply bask in what the game throws at you (keeping a well opened mind of course) you will come out the other side perplexed and captivated. The game’s rough, there’s no escaping that fact, you can tell by just looking at it. But once you ‘get’ what’s going on and throw caution to the wind you’ll find quite the gem of a game. Sadly, not everyone is going to see this, and it’s the game’s serious lack of universal appeal despite initial appearances, that will ultimately hurt it. However, if you’re one of the steadfast who endure and stick around for the duration, you’ll come away pleased at the experience you just had.